You know big business is getting worried when Qantas CEO Alan Joyce makes alarmist claims like a return to industry-wide bargaining will create chaos and threaten jobs – https://bit.ly/2PIKoTm. TWU (Vic/Tas Branch) Secretary John Berger said the greatest threat to jobs and worker prosperity is, in fact, a broken industrial system that has allowed Joyce to trample workers’ right. 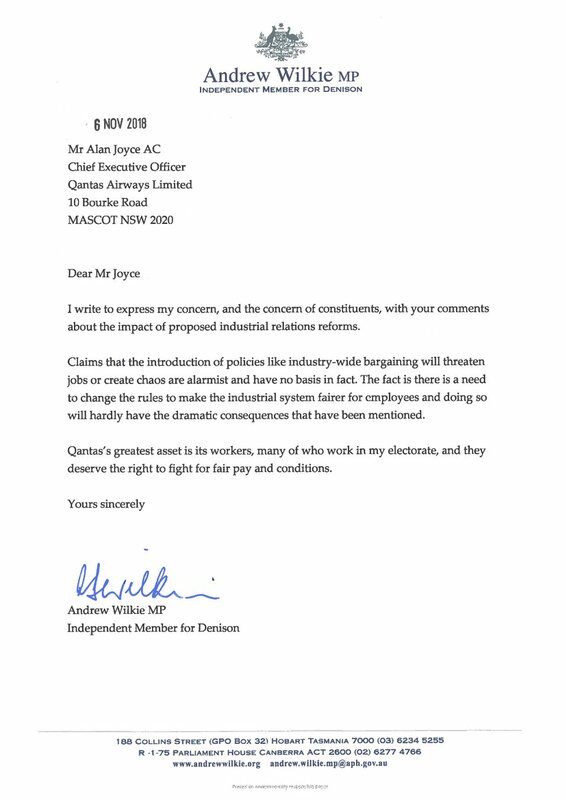 ACTU Secretary Sally McManus also published 11 points to counter Joyce’s comments supporting the big business campaign to stop working people having fairer rights at work – read them below. And the respected Independent MP Andrew Wilkie – Independent for Denison sent a letter to Joyce in which he supported aviation workers and the campaign to #ChangeTheRules. “Qantas’s greatest asset is its workers and they deserve the right to fight for fair pay and conditions,” he said. 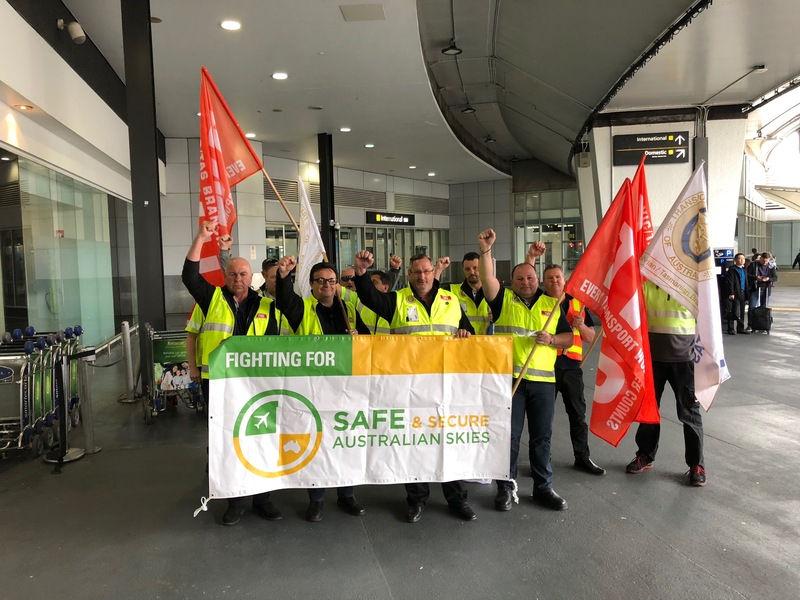 Transport Workers Union – TWU members have been joining the fight for industry-wide bargaining in huge numbers because they know it is the only way to ensure fair jobs and a secure future. So get on board -this is how we win! Qantas is doing very well out of the current system. They delivered a $1.6B profit and Joyce is one of the highest paid CEOs on $10.9mil. Qantas doesn’t even do “enterprise bargaining”. They have many agreements according to occupation and subsidies across Qantas. Their own workforce is divided up many ways on multiple different agreements. Qantas also sets up companies owned by them so they can hire workers on lower wages and conditions. This puts Qantas workers wages under constant pressure as their jobs could be contracted out. The contracting out of baggage handling for example, has led to a race to the bottom. Wages and conditions have gone backwards. Workers have no say over their working conditions as one company loses a contact because they are undercut on wages. Workers change uniforms and get a wage cut they have no say over. These jobs could once support a family, now workers sleep at the airport because they can’t afford to travel home between shifts, earning the absolute minimum. Why shouldn’t baggage handlers be able to set a fair minimum price for wages and fair working conditions to stop this downward competition purely on their wages? Sector bargaining works well and is normal in most OECD countries where Qantas and other successful airlines operate. Alan Joyce is singing from the big business song sheet, trying to say it is small business who will be affected. But this just not true. They are using small business to hid their own self interest. Qantas will cut prices to suppliers if they can get away with it, just as they ruthlessly shut down their airline when negotiating wages with their employees. Alan Joyce wants no changes to the current system that works very well for him where senior executives packages continue to grow whilst other workers have little power to stop the structural downward pressure on their wages.